Finally… I have finally done it!!! This is the reason I haven’t been buying much, or anything at all for that matter, these past couple of months. Awhile back, I decided that I was finally going to complete my Kamen Rider 555 Rider Gear collection. Since then, most of the extra cash that I have been saving up has been going to my Kamen Rider 555 Gear fund. And after a couple of months of hunting on auction sites, online stores and local stores, it is finally done. I can’t begin to tell you how happy I am. Being a die-hard Kamen Rider 555 fan, this is truly the centerpiece of my Kamen Rider collection. If you were to ask me why I like this series so much, I would definitely attribute it to the dark setting and realistic characters (though the ending does have its problems). Not to mention, the movie, Paradise Lost, was simply phenomenal. But what captivated me most from the series is undoubtedly the designs of the Rider suits and the Rider Gear. Not only do I like the technological aspect of it, I also like the fact that they are used as actual objects and tools as opposed to the traditional personal-use-only belts. The cases, a.k.a. 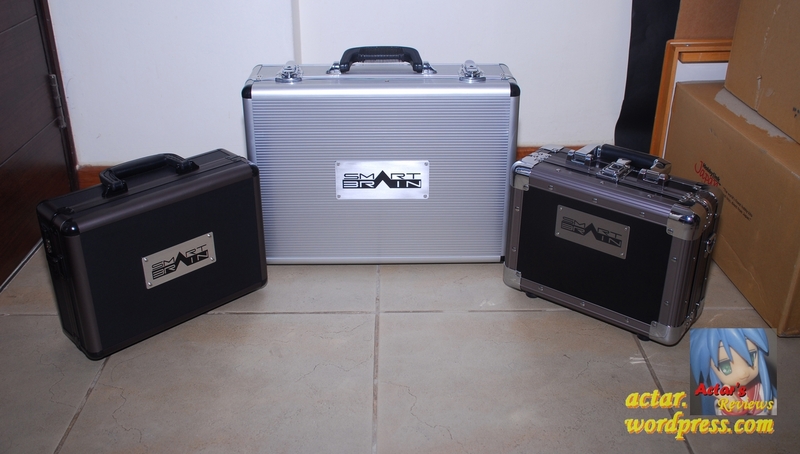 Gear Boxes, are also awesome as they allow for an exceedingly convenient and cool way of storing them. 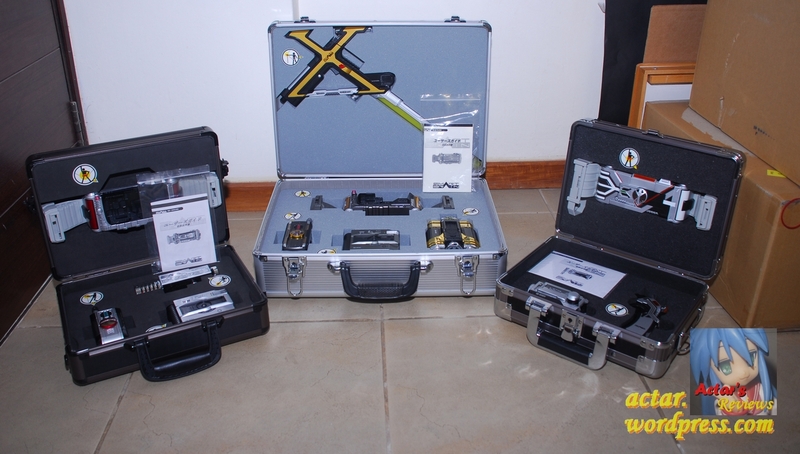 …and as you’ve doubtlessly already seen, my Gear collection does not consist of only the DX toys, but the Gear Boxes as well. These Gear Boxes aren’t toys. 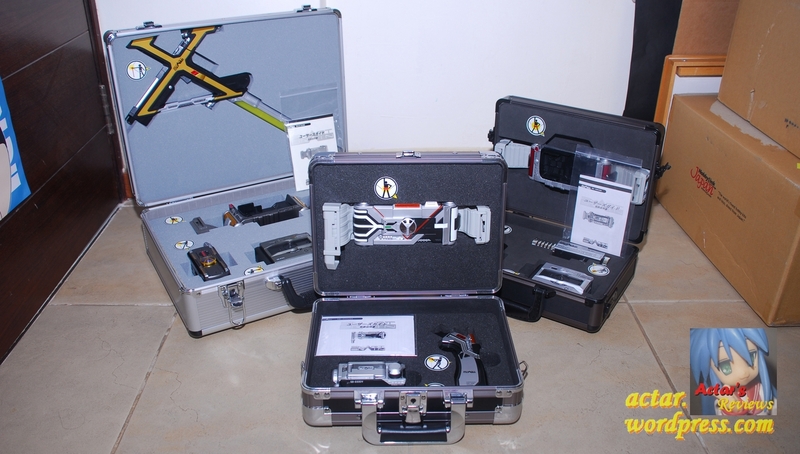 They are replicas of the actual cases used in the show and have been re-created to match them as closely as possible, from the instruction manuals (which contain the DX toys’ instructions) to the icon stickers to the precision-cut foam. Each of the cases also have a metal plate affixed to the front bearing the iconic Smart Brain Logo. Of course, let’s not forget about Faiz’s other upgrades and accessories. 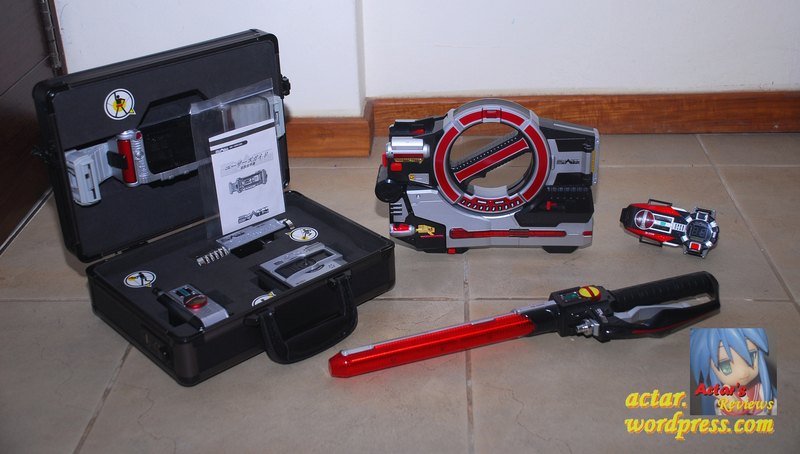 To the right, we have the Faiz Edge, Faiz Blaster and Faiz Axel Watch. A video showcase will be uploaded to my Youtube page sometime soon, and that will also feature the Psyga Driver and Orger Driver, both of which are not pictured. This entry was posted on Monday, September 12th, 2011 at 9:37 am and is filed under Actar's Acquisitions, Figures, Merch and Stuff. You can follow any responses to this entry through the RSS 2.0 feed. You can leave a response, or trackback from your own site. ;3; Actar… It makes me happy to see that someone else loves 555. Just curious, are there any other Kamen Rider Series that you like beside Faiz? @ kili-kun: Aside from Faiz, I like: Double, Kabuto, Decade, Den-O, Black and Black RX. Ozu was okay, but not too heavily invested in it. Currently, I’m getting into Ryuki. It’s nice to hear your response of the other Kamen Rider series that you’re interested. Also, is there any other S.H.Figuarts that you’ll be getting? Because I’m currently planning to get all the lead Kamen Rider and possibly secondary riders in Figuart form. It’s been along time to see..the blog was alive!! I forgot..is that all DX ? May i ask, where to bought this Faiz gears? Is it you custom make it yourself? hello do you sell these henshin belts? you could min for the complete selection of Kuuga? hi, onegai can you please tell me how to have all complete faiz gear ? Are you going review kamenrider decade.If you are I be happy to see them. There’s definately a great deal to know about this subject. I like all of the points you made. where can i buy faiz gear? Been thinking of mqking a case for my CSM Kaixa Gear. The metal plates and foam will be tough as I don’t know where I can get one as well as the screws on each corner. The foam seems to have some tutorials on what to do and all I need is to find a shop that sells foam. sir would u sell me the faiz gear?